YORK, Maine — Aaron Kempner Thaler, 28, of York, and until recently of San Francisco, Calif., passed away peacefully at home on Sunday, April 24, 2011, surrounded by his family. Aaron was born in Exeter, N.H., on Dec. 8, 1982, the son of Alalia and Frederick Thaler. He graduated from York High School in 2001 and Wesleyan University in 2005. During his junior year abroad in South Africa, Aaron was diagnosed with a high-grade brain tumor. He met the challenges brought on by the disease with dignity and courage. In between surgeries, radiation treatments, and chemotherapy protocols, both standard and experimental, Aaron traveled to Africa, Israel, South America, and all over America with his family and friends. Within weeks following major surgery in 2009, Aaron exuberantly hiked to the top of Half Dome in Yosemite National Park. Aaron settled in San Francisco in 2006 and worked as a case manager at Lutheran Social Services, assisting clients disabled by HIV/AIDS. 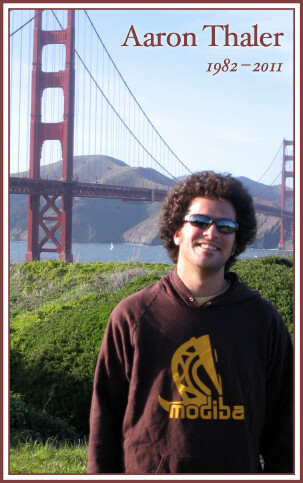 In his free time, Aaron volunteered for SF Jazz, which suited his eclectic musical tastes, played league soccer, and developed his guitar chops. Aaron was often the focal point of his large circle of friends. He was celebrated for his generous spirit, his love of sports (especially Boston's professional teams), his unbridled passion for Frank Zappa's musical genius, his strong opinions, and his irreverent sense of humor. As his final gift, Aaron donated his brain to the Massachusetts General Hospital Neuro-Oncology Research Department. Aaron is survived by his parents; his brother, Jesse and his wife, Sasha, of Cambridge, Mass. ; his paternal grandfather, Joseph, of Merrick, N.Y.; and his many aunts, uncles and cousins. Aaron will be greatly missed by each and every member of the extended Johnson family as well as his four-legged beach walking companions, Rico and Sadie Mae. A celebration of his life will be held at 4 p.m. Saturday, April 30, 2011, at South Church in Portsmouth, N.H. Online condolences may be made by visiting www.jspelkeyfuneralhome.com. Aaron has requested that memorial donations be made to the Massachusetts General Hospital Development Office, Brain Tumor Research Fund, 165 Cambridge St., Suite 600, Boston, MA 02114, or the Brain Tumor Research Center, University of California San Francisco, 220 Montgomery S., 5th Floor, UCSF Box 0248, San Francisco, CA 94143. Care for the Thaler family has been entrusted to J.S. Pelkey Funeral Home.